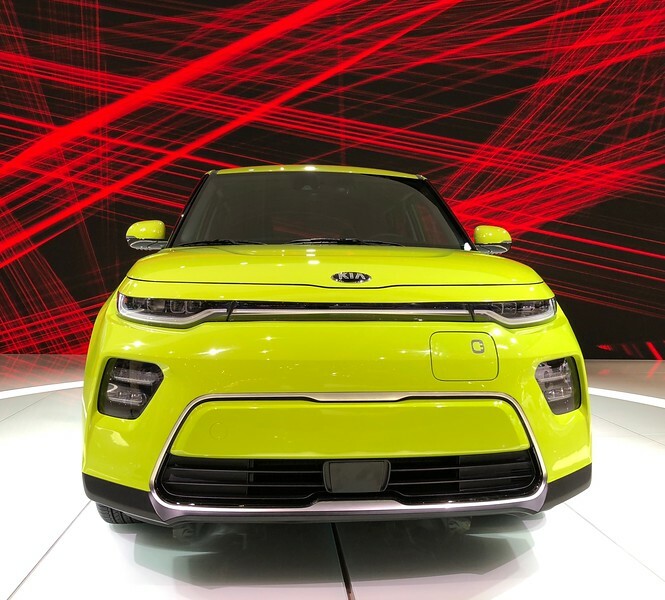 I suppose it was the excitement of seeing the next generation Soul EV that I can use as an excuse for being an idiot. I bought a ticket online and had time this afternoon to drive downtown in the rain, knowing Thursday would be less crowded than the weekend. I passed through security and headed for the West Hall but nobody asked for my ticket. I then realized that the show wasn't open to the public until tomorrow and they were checking for official badges or wrist bands at the entrance to the Hall. A young lady was doing this, but I kept my head down fake-texting an urgent message as I briskly walked by her into the hall. As you might expect, it was filled with photographers, videographers, car reviewers, etc. 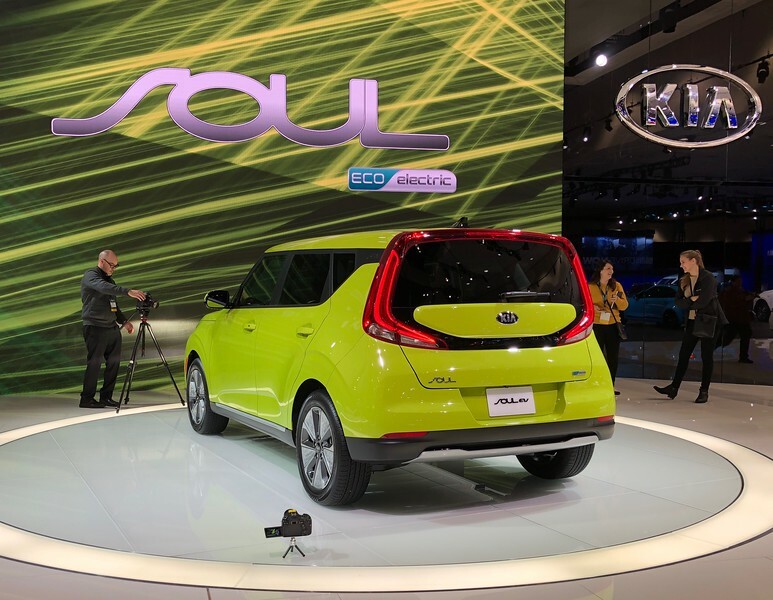 The lone Soul EV, not my favorite color, was being tape measured by a Korean group and was locked. I took a few photos and then a Kia rep unlocked it and turned the lights on for a photographer/reviewer. I managed to peek inside and get a quick shot (below) of the panel; range looks impressive after reading that it would only have a 140 mile range! For what it's worth: This is a pre-production model, none available for a test drive during the show; might be available by March. Thank you all for the great info on this forum! Ha, that's funny. You know what they say, fake it 'till you make it! Too bad you didn't get more shots of the interior, not too many of those around. Do you know if the car had heated rear seats or ventilated front seats? I can't find any info on those in the press release, and it would be a shame to lose those two features. I don't see any seat heat/cool buttons, but if you look on image 25 and make it full screen then it looks like there are blanks for buttons to be fitted, so this is probably just the base model. 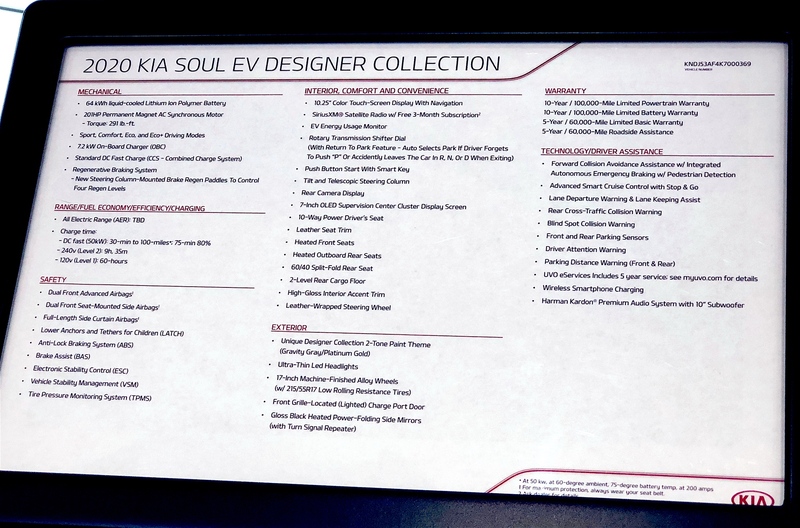 I've posted one more photo, of the info card in front of the sole Soul EV on display. It has a VIN in the upper right hand corner, clearly not matching it; shows a color combo of Gravity Gray/Platinum Gold, with Gloss Black side mirrors. To somewhat answer Kish's question, it does have front/back Heated Seats; no mention of ventilation/cooling function. HK Premium Audio with 10" woofer! Whoa, that's interesting. I believe that the "Designer Collection" is the top level trim. Good that it has heated rear seats, but looks like no more ventilated seats.